Some 14 people have been killed in a massive storm which brought destruction to the northern Philippines, a presidential adviser says. Typhoon Mangkhut ripped through the Philippines' main island of Luzon, and is now moving west towards China. The storm tore off roofs, felled trees, triggered 42 landslides and caused extensive flooding. 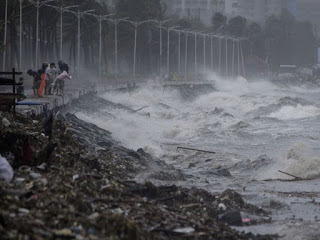 Mangkhut unleashed winds of 185km/h (115mph) as it careered from east to west across the north of Luzon. Five million people were in its path, and thousands were evacuated.